I am somewhat ambivalent when it comes to molecular gastronomy. As much as I drool over blog posts published by the chosen few who had the chance to enjoy one of Ferran Adrià’s spectacular meals, when I challenge myself to decide whether I would genuinely enjoy that kind of experience or not, well, I’m not so sure. Don’t get me wrong; I would book a flight and go to El Bulli if I could make it before Adrià closes the kitchen for good, but it would mostly be because of the exclusive character of the experience, the once-in-a-lifetime opportunity, and because, deep down, I am a bit of a chef groupie. There, I said it. But do I feel true attraction for molecular gastronomy? Not really. In truth, I don’t know that much about molecular gastronomy (which I will abbreviate to MG from now on), but I know that I like true, simple flavors. My favorite cuisine is Italian, for the love of fresh and authentic ingredients made into modest but luscious and oh-so-satisfying dishes. But I’m also very curious, and a true gourmande at heart, so I love to witness (and taste) the evolution of the culinary world. Some MG techniques have become quite common in the restaurant world, such as foams, spheres (or caviar) and even the use of liquid nitrogen. But will they ever make it to the home kitchen? 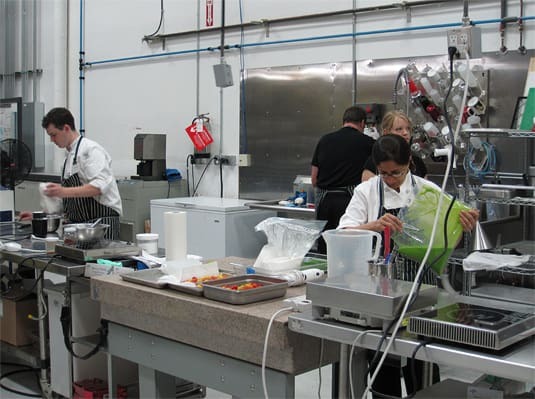 A peek inside The Modernist Cuisine kitchen lab. This is just a small portion of it. That may be the bet that the authors of the new MG “encyclopedia”, The Modernist Cuisine: The Art and Science of Cooking, are putting their money on. I’m calling it an encyclopedia just for the sheer size of the work: 6 volumes, 2,400 pages, 3,500 photos and illustrations, 43 lbs total weight! It took 4 years, 36 writers and editors and certainly a stellar budget to get to this. Who could afford (and have the courage) to undertake such an ambitious project? Mr. Nathan Myhrvold, the first Microsoft CTO, that’s who. Mr. Myhrvold has had a lifelong love affair with food: he’s had a culinary training, he worked in restaurants, he acted as Chief Gastronomic Officer for Zagat Survey and even won the World Championship of Barbecue in 1991. He’s not new to the game, and his passion (and monetary means) allowed him to recruit chefs Chris Young and Maxime Bilet (formerly from The Fat Duck) to build their very own laboratory kitchen and conduct experiments that would lead to The Modernist Cuisine. Chef Maxime Bilet and Author Nathan Myhrvold. Attached to the International Food Blogging Conference in Seattle were a handful of optional activities offered on a first come, first served basis. As soon as The Modernist Cuisine lab visit invitation was posted, I emailed the organizer with little hope of making it since very few visitors would be allowed in. Just a week before, they had released a 20-page PDF excerpt that had the blogging world buzzing over the astonishing photography and extravagant setup built for the book. Nevertheless, I got in and was very excited to have an exclusive insight into what will certainly become a very influential work in the MG world. Not knowing what to expect, I drove to an industrial area of Bellevue and walked around a nondescript beige building to be welcomed into a real science lab. The Modernist Kitchen is located on Mr. Myhrvold’s Intellectual Ventures premises, a firm dedicated to creating and investing in inventions. Waiting to get in, and sipping a glass of white wine, I could see medical equipment, high-precision microscopes, detailed human organ diagrams. Nothing to make me hungry, except for the printed menu detailing the food they would serve us: 5 snacks and 5 small bites. Watermelon chips (yes, watermelon can be fried, who knew!) and foie gras cherries (not really cherries, they’re made of foie gras). 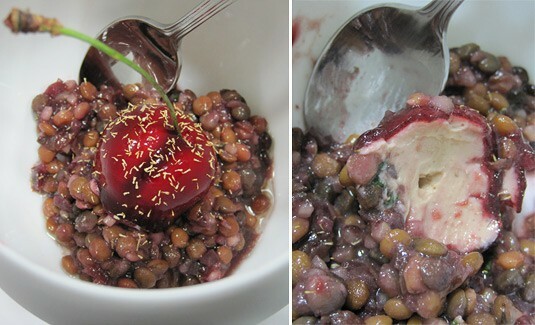 Lentil Salad with Foie Gras, Bing Cherries, Chamomile (the bing cherries are diced and incorporated into the salad). Turns out there were about 25 of us waiting to be allowed inside. We followed a PR person to the kitchen, which looked like a cross between a warehouse and a science lab – nothing like a commercial kitchen at all. We were introduced to Mr. Myrhvold and his crew, and the food started to be passed around. Q: $625 (list price) for a cookbook – isn’t this a bit steep? A: You’ll get it for less if you pre-order it on Amazon! (It’s still $500…) Of course, it’s not cheap, but for the research, photography and culinary advance, this book promises to deliver. Q: Couldn’t you sell each volume separately? A: No, we felt it was meant to be sold as a complete work. Moreover, we are constantly referring to other volumes to make the content more concise. It would have been impossible to repeat all referenced material to make each volume independent on its own. Q: Did you approach publishers before deciding to self-publish? A: Yes, and they weren’t interested. But by the time we got the negative answers from the publishers, we had already build the lab, hired freelancers, bought a lot of the equipment – a lot of money was already spent, so self-publishing was a logical answer. Q: How many do you have to sell to be profitable? A: We hope to sell at least 5,000 copies. 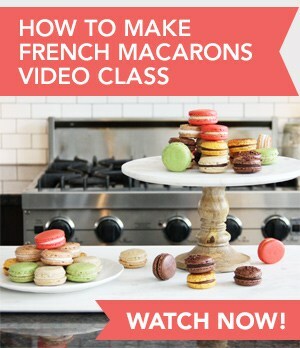 Q: Can this be used as educational material for cooking school students? A: Not out-of-the-box. It’s a very informative work, but a curriculum would have to be built around it. Q: Do you have plans to release The Modernist Cuisine as a digital book? A: Not at this time. We truly believe that this is a work that is meant to be published on paper (click to see how the book will be printed). If the sales of the book go as expected, we will consider a digital version, but not in the near future. When visitors were busy tasting the dishes, I had the chance to go to Myhrvold and Young and ask them all of my questions (see above) directly. 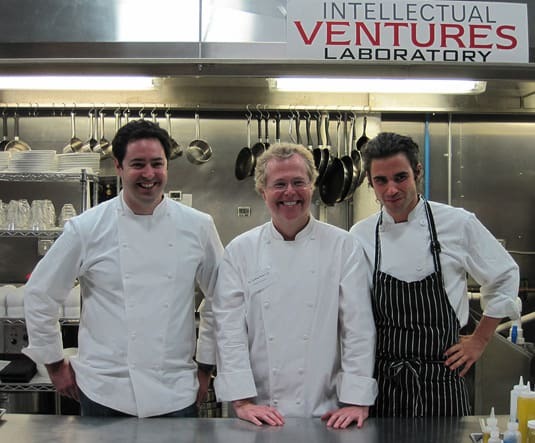 I also tried to grill them about the great Ferran Adrià – does he know about what you’re doing? What does he think about it? Were you confronted by MG experts as to why you (with all due respect) are better positioned to write the biggest molecular gastronomy work ever printed; something that could have been expected from Mr. Adrià? Even these questions didn’t unsettle Myhrvold or Young, and they gave me equivalent answers. The great MG chefs right now (be it David Chang, Wylie Dufresne or Ferran Adrià) are in their restaurant kitchens and simply can’t afford the time or the money to produce this kind of written work (chefs Young and Bilet have been working full time on the book, not in a restaurant kitchen, for the past three years). Myhrvold and his staff have consulted with all these chefs, and many of their recipes will be adapted in The Modernist Cuisine. They have all provided quotes praising the book, and Myhrvold even told me he exchanges “daily emails” with Adrià and that he had been very generous with his time by providing advice and reviewing chapters of the book. So! It seems that all is well in the MG world: no competition; all working towards the same goal of culinary innovation. The book’s elevator pitch even boldly claims to aim at reinventing cooking. Horse Mackerel Sashimi, Ginger, Plum. 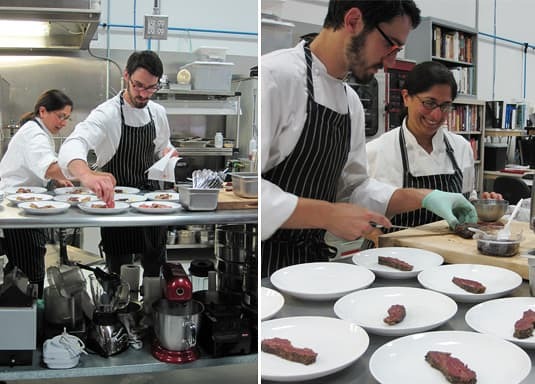 The Modernist Cuisine kitchen staff preparing plates of Wagyu Beef Cheek Pastrami, Black Bread, Beef Marrow Mousseline. 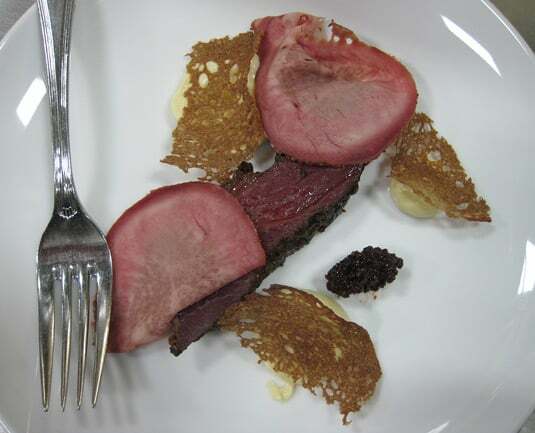 Wagyu Beef Cheek Pastrami, Black Bread, Beef Marrow Mousseline. During the visit, I could see some ruffled feathers, especially amongst my female peers. Molecular gastronomy is (right now) mostly men’s territory. Women tend to approach cooking with emotion, feelings; they cook with their hearts. Visiting a kitchen turned into a surgical environment, hearing dishes described as experiments, seeing a pantry filled with jars labeled with chemical names nobody’s ever heard of before – all of this can ruin your appetite if you are attached to the emotional side of food. What do I think about this undertaking? I think that most things in this world advance with research and development. If someone is passionate enough to dedicate so many resources to culinary advancement, I say, go for it. Everybody’s going to win. It doesn’t mean that I’m going to have a centrifuge-this or an ultrasonic-that in my kitchen any time soon, but these innovations may boil down to simpler tools and techniques that will make cooking easier and food taste better. I would love to get my hands on The Modernist Cuisine; to learn from it and be inspired by this important work and its incredible photography. To be a witness of this true research thesis and hopefully get a glimpse of the future. 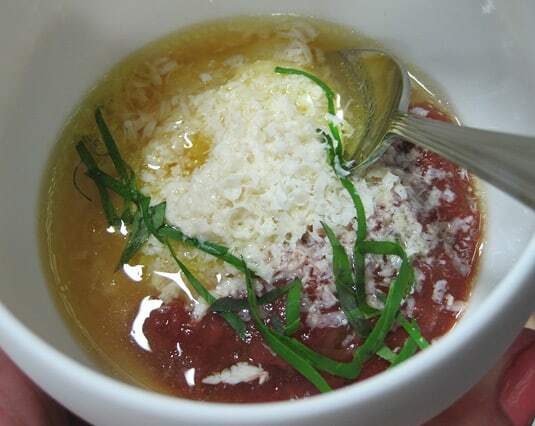 The dish that may itself make it worth buying the book (my favorite): Pressure-Cooked Grits, Strawberry Marinara, Corn Husk Consommé. 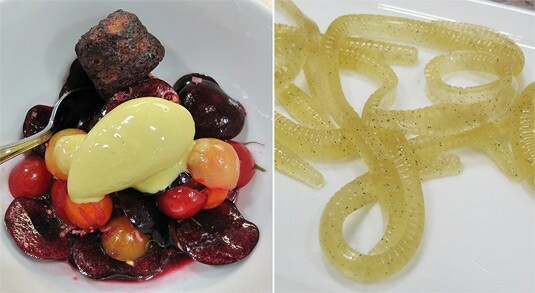 For the sweet tooth: Frozen Pistachio “Cream” with Cherries, Tomatoes, Lemongrass, Rum Cannelé; Olive Oil Gummy Worms. The Authors: Chris Young, Nathan Myhrvold, Maxime Bilet. 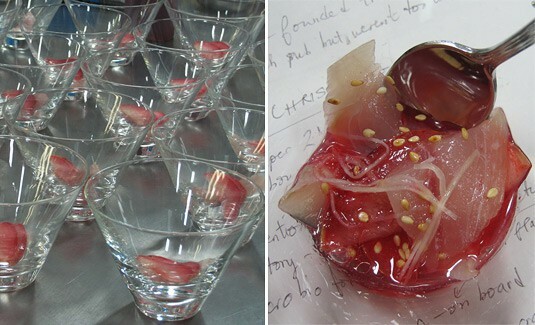 11 Responses to The Modernist Cuisine: Future or Science Fiction? I'm with you, in that I prefer simple foods…but this looks so interesting! Now I wish I'd gone to it. I thought Dr. Myhrvold's presentation at the conference was fascinating. enjoyed playing with chemistry sets this is the place for you. Overall, very entertaining, not especially filling, like nothing we've ever had before, plenty of laughs. Upon reflection, realized that over 14 courses no one asked if we were enjoying the food; odd yet makes sense too, it's all about them, not you. Sean, you're right, the carrot soup served on the Conference's first night was delicious. Your dinner at La Vineria looks like it was very entertaining! I have to admit that it's dishes like "Lambless Lamb" that turn me off molecular gastronomy. But! I wouldn't say no to live this experience once, at a restaurant where the chef is well known for mastering MG, be it Adrià or one of its apprentices. I love your last sentence for its accuracy, "It's all about them, not you" – I'm sure Amy would agree with that too. Thanks for sharing your experience! 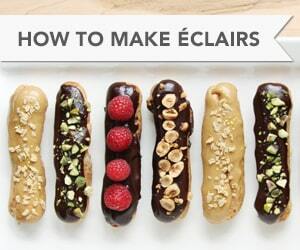 My post will be up on Epicurious towards the end of the month, I will tweet when it goes up! Had the food been spectacular I might have been sold, but for the most part it was just ok. Until the food actually tastes better than dishes cooked conventionally, I can't be all that impressed by the "boys and their toys." Joanne: I personally liked most of the dishes they served us. I was surprised to see that they were very approachable, not the sci-fi stuff I expected. Except for some less harmonious pairings, it was very good food, but I wouldn’t call it spectacular, as Amy says. I do know that they used tools and techniques to yield results they wouldn’t have been able to get to in a regular kitchen. I found the flavors were very intense and pure, kind of going back to the very core of each ingredient, bringing the maximum flavor out of them. It was especially true for soups, the pistachio gelato and the strawberry marinara. As for the health side of it, I don’t know enough about MG to give you an informed answer. Nathan Myhrvold raised a good point in its IFBC conference saying that some MG critics will say that agar agar is bad for you (an ingredient that’s been in Asian pantries for thousands of years) while they use baking powder, an ingredients that’s been used for just 150 years and that’s not any more natural than agar agar. I guess you will find advocates and arguments on each side of the debate, but personally, I’m not fond of using ingredients that seem to come from a science lab rather than a pantry. But maybe it’s just that I’m not educated enough on the question. 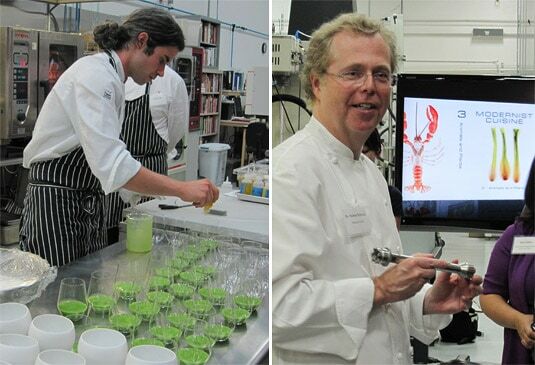 Overall a very interesting visit that made me want to learn more about molecular gastronomy, its basic principles. Although, just like Amy, I’m not anywhere close to make my own foams, spheres, ultrasonic or even sous-vide cooking. I’ll leave that to the experts. Amy: Did you publish your article about your experience and opinion about molecular gastronomy? I would be very interested in reading it. 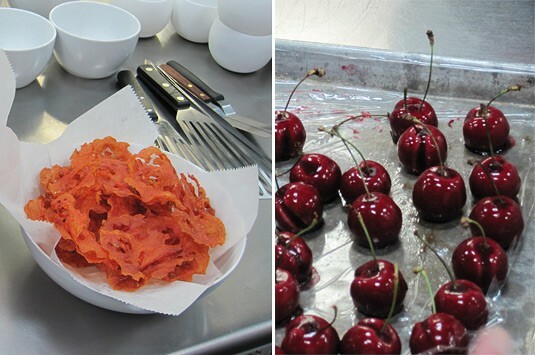 You took some amazing images and excellent write-up on your tour through the Modernist Cuisine lab! I would've luved to have attended if I had flown in earlier. Very interesting post indeed. Like you, I've never tasted MG food but I was always curious on what it is exactly. I also like Italian food since it is genuine and frankly, I would know what I'm really eating. Is MG type of food nutritious? Although I've never tasted MG food, I don't know if i would fancy eating food which has been under a microscope. Since you've tasted it, is this type of food as good as the 'real' food?